In California, visitation rights are often included in a custody agreement in order to allow both parents to spend time with a shared child. Trying to fight for your right to spend time with your child can be stressful - especially without the help of a child custody lawyer. A visitation order is part of a child custody order that allots specific time for a noncustodial parent to spend time with his or her child. The order may specify dates and times that a noncustodial parent will be with the child, or it may simply state that the noncustodial parent has the right to spend time with the child while leaving the specifics up to the parents. In order to create and follow a successful visitation order, you will need to understand how child custody works in California, whether you need a visitation order, and how to create one that works for your family and can be approved by a judge. Who Has the Right to Visitation with a Child in California? How do I find out whom Has Rights to Visitation with my Child in California? In California, parents, and sometimes grandparents, have the right to visitation with a child. When it comes to determining child custody and visitation, the first step is determining the paternity of a child. There are several ways that paternity can be established, and if you have questions about paternity, you should contact a paternity attorney in your area. Generally, if two people are married either at the time of conception or the time of the child’s birth, the father can be assumed. However, if the parents are not married at these times, paternity will need to be established. Once a child’s parents have been legally determined, either parent may apply for custody. This can happen during a divorce or legal separation, or as part of a paternity case in California. When physical custody is determined, two options exist: one parent may be granted sole custody, or both parents may be granted joint custody. In the case that joint custody is granted, visitation is unnecessary because both parents are already spending time with the child under the custody agreement. However, when one parent is granted sole custody of the child, a visitation agreement is necessary to provide a legal court order that allows the other parent to spend time with the child. In California, grandparents may also request visitation with a grandchild under certain circumstances. Like child custody, visitation orders are always determined based on the best interest of the child. What Kinds of Visitation Orders Exist in Southern California? There are several types of visitation orders that may be issued in California, including both parental and grandparent visitation orders. Scheduled visitation is the most detailed kind of child custody order in California. This kind of order can be extremely specific; it may include a calendar that has the details like the dates, times, locations, and people involved in all exchanges of the child between parents. Things like birthdays, holidays, school vacations, travel, family vacations, summer camp, and more may be included. Scheduled visitation orders leave little room for flexibility or negotiations, and it is simple to determine when either parent is not following the terms of a scheduled visitation order. If two parents have trouble coming to an agreement on custody and visitation, this may be a good option to help both parents stay on track. The parents can create their own scheduled visitation order, they may work with a mediator, or the judge may create one. Reasonable visitation is slightly less strict and includes fewer details than a scheduled visitation order. Rather than scheduling specific dates and times that the children will spend with the noncustodial parent, reasonable visitation orders provide a general timeframe when the children will be with the noncustodial parent. The details of who, when, where, and for how long regarding visitation are left up to the parents. Reasonable visitation allows more flexibility for the family of the child, which can be beneficial. However, reasonable visitation may only work in situations where the parents are on good terms, have good communication skills, and are willing to work together to schedule specific times when the child will spend time with the noncustodial parent. The reasonable visitation schedule still has guidelines regarding the time the noncustodial parent will spend with the child - so the parents will need to work together to follow these terms. Whether a visitation order is scheduled or reasonable largely depends on the relationship between the custodial parent and the noncustodial parent. 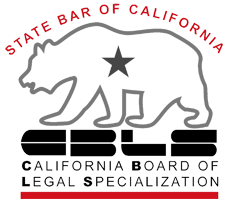 What are Supervised Visitations in California? In some cases, it is not in the best interest of the child to spend time with the noncustodial parent alone. Supervised visitation allows the noncustodial parent to spend time with the child and exercise his or her parental right so to do, while protecting the child and his or her best interests. Under a supervised visitation order, the child will only spend time with the noncustodial parent under the supervision of another adult. This adult may be the custodial parent, another family member or family friend, or a professional, depending on the specifics of the child’s family situation. Supervised visitation orders may be reasonable or scheduled, but more likely than not they will be scheduled. In addition to including the times and dates that the noncustodial parent will spend with the child, a supervised visitation order may also specify who will be supervising each visitation, where it will take place, and how the child will be exchanged between the parents. Supervised visitation may be appropriate in situations where the child and the parent have no existing relationship, regardless of why, in order to allow them to create one. It may also be appropriate in situations where the parent has proven that he or she is not capable of providing a healthy environment for the child to spend time, but wishes to show that he or she is making changes and moving towards unsupervised visitation. Sometimes, a judge may determine that it is not in the child’s best interest to spend time with the noncustodial parent. Unlike the first two types of visitation, when supervised visitation or no visitation is awarded to the noncustodial parent, it is because of the child’s best interest rather than the relationship between the custodial parent and the noncustodial parent. If the parent is not able to provide for the child, cannot provide a suitable environment for a child to live, fails to provide adequate supervision, fails to care for the child’s education, healthcare, or general well being, exposes the child to substance abuse, or in any other way fails to protect the child’s best interest, the judge may not grant visitation rights. If a parent is physically or mentally abusive, or has a history of domestic violence or child abuse, visitation is not likely to be granted. If the parent’s situation changes, he or she may petition the court for visitation at a later date. As Grandparents what are our Visitation Rights? 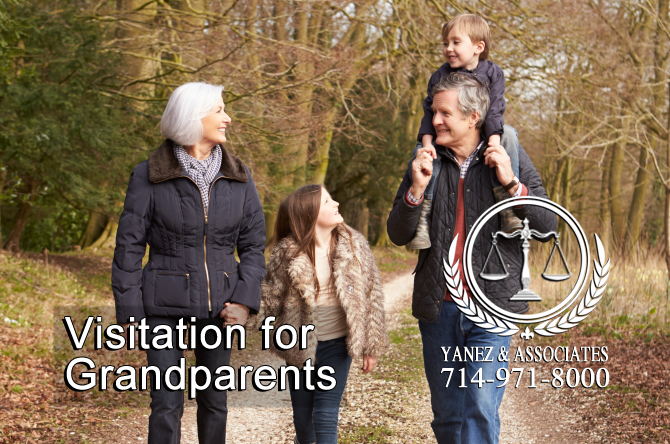 • The grandparent’s right to visitation may not interfere with the parent’s rights to make decisions regarding his or her child. • If a stepparent has adopted the child. Grandparents are unlikely to spend as much time with a child as a parent would; however, a grandparent is likely to be granted reasonable visitation with a grandchild if it is determined to be in the child’s best interest. "I have a question for a California Child Custody and Visitation Attorney in Orange County"
If you have questions about creating a visitation order, your visitation rights, or how the law regarding visitation might affect your family, it is always in your best interest to contact a legal professional in your area. If you are looking for legal advice in Southern California, contact the attorneys at Yanez & Associates. Our professional attorneys have extensive experience in California family law, including child custody and visitation. We offer free initial consultations to new clients, and we would love to meet you! Contact us today to schedule your initial consultation. For more answers to questions regarding a non-professional provider of supervised visitation please click on the following link to be re-directed to a guide for the non-professional provider of supervised visitation. 2 Who Has the Right to Visitation with a Child in California? 3 What Kinds of Visitation Orders Exist in Southern California? California Child Custody and Visitation Attorneys in Orange County, Top Child Visitation Attorney in Orange County, visitation, visitation attorney for Irvine CA, What Kinds of Visitation Orders Exist in Southern California?, Who Has the Right to Visitation with a Child in California?